The Anti-Dropout. Two pieces: the technical problems of the next decade won’t be solved with knowledge that can be self-taught, and the next generation of innovation will come from large organizations where credentials matter. Code With Me, a two day introduction to HTML/CSS/jQuery for journalists, came to Portland last weekend. Even though it was beautiful weather outside, forty students and twenty mentors gathered deep within The Oregonian to improve their digital chops. Just think a bit on those numbers — that’s a lot of people. Last December, I reached out to Susan Gage, managing editor for digital at The Oregonian, about hosting a hackathon. We had initial conversations about the idea, pulled in Lauren and Ivar, and started planning. Then, in February, I began hearing a bunch about Sisi, Tom, and Code With Me. I got the full download on how Code With Me works from Sisi at NICAR. After a brief discussion with Lauren and Ivar, it became obvious bringing Code With Me to Portland was a much better idea than a hackathon. So we set about convincing Sisi and Tom it was worth their time. Tom and Sisi have spent a lot of time considering their approach and pulling resources together. All of their effort showed. All of the exercises were available online during and after the presentations. Useful for students to review. Each student had a printed reference sheet with many of the topics we covered. The paper coding exercise was amazing. It was a hands-on, physical application of very digital knowledge, and also promoted discussion between students. Twenty mentors donated their weekends. Wonderful support from the community. The Oregonian stepped up with the location, Knight-Mozilla Open News covered much of the costs, and Automattic generously covered the mentor thank you dinner. Refresher for mentors on teaching strategies. Even though we only had two students to work with, it was still challenging to switch into teacher mode, adapt to different learning styles, etc. Assistance with scoping student projects. Provide a set of tools/resources (e.g. jQuery plugins, TableTop.js for transforming a Google Spreadsheet, etc.) mentors can refer to when helping students build their projects. Saturday lunch: Cultured Caveman is a delicious food choice, but one needs to be a little more deliberate about what you need. We were short on some vegetarian options. Mentor dinner: The Picnic House was the only place, of the half dozen I called, I could find to accommodate a party of twenty on Saturday night. Good deal for the associated costs. Service was a little slow / awkward. Sunday lunch: Cha Cha Cha has the catering thing nailed. Enough food and options for everyone’s dietary needs. How can we better enable educators to teach these skills to their students? Do students have the opportunity to apply their new knowledge? How do their skills progress over time? For those of us who want to continue contributing as mentors, where do we go next? What’s the most valuable use of our volunteering time? First, the people running the old system don’t notice the change. When they do, they assume it’s minor. Then that it’s a niche. Then a fad. And by the time they understand that the world has actually changed, they’ve squandered most of the time they had to adapt. AMA with Salman Khan, founder of Khan Academy. What an epic comment thread. 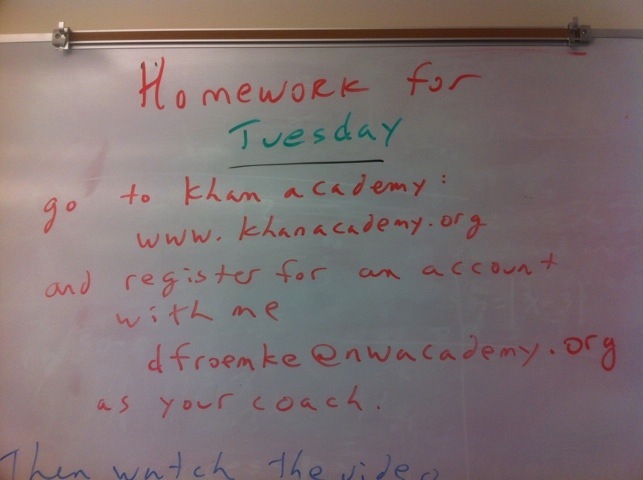 Cultural artifact: Tonight’s class homework is to go register an account with Khan Academy and add your teacher as a coach. But what if they want a different coach? Easily done. The case against college. This is the sound of a huge falling tree. Khan thought he could offer teachers crucial new insight into how students learn. He envisioned a dashboard system that would track students’ individual statistics, showing them and their instructors how many videos they’d watched, how many questions they’d answered, and which ones they’d gotten wrong or right. Normally, of course, teachers fly blind. They use quizzes, homework, and their own observations to try to figure out how much their students understand, but it’s a crude process. Day to day, it’s hard to know what a student is and isn’t learning. A dashboard, Khan says, can change all that. But by being able to target her students for special help exactly when they needed it, Cadwell saw stunning results: The class’s test scores improved more than 106 percent in half a year. One girl I met in the classroom had advanced an astonishing 366 percent. “I hated math,” the girl tells me cheerfully. “But now it’s actually fun.” She began the year unable to do basic fractions; during my visit, I watched her plow through complicated long division, carefully working problems on the Khan software. How Khan Academy Is Changing the Rules of Education. Whether or not the Khan Academy ultimately succeeds, the trend is very real. PS: I took the blog post down after NYU received a “cease and desist” letter, and I was advised by my superiors that I may be liable for legal liabilities if I keep the post up. They could not perform a full legal analysis, and as a precaution they asked me to take the post down. For work-related issues, the employer has the right to restrict “free speech”, a ruling supported by many decisions of the Supreme Court. It made no sense for me to disobey and try to fight the C&D letter by myself. Panos Ipeirotis — Comment on Business Insider’s “NYU Professor Catches 20% Of His Students Cheating, And He’s The One Who Pays For It” and related to this previous note. I wish we knew more about the thinking within NYU’s administration. Isn’t this what universities are supposed to stand for? In other words, my theory is: Cheating (on a systematic level) happens because students try to get an edge over their peers/competitors. Even top-notch students cheat, in order to ensure a perfect grade. Fighting cheating is not something that professors can do well in the long run, and it is counterproductive by itself. By channeling this competitive energy into creative activities, in which you cannot cheat, everyone is better off. Public projects – All of the work ends up public, so embarrassment is the deterring factor. Peer review – Students have to present their work in class, and are judged by others. Competitions – Grades are performance-based (e.g. students build websites to attract the greatest number of unique visitors). Takeaway: If plagiarism is your biggest worry, you’re doing it wrong.